The band will perform at NAMM in Anaheim on Jan. 28 on the Main Stage in the Grand Plaza. 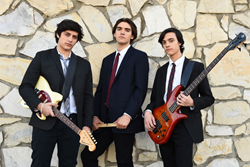 Local rock band Red Letter Day was chosen as a winner of the prestigious John Lennon Songwriting Contest (JLSC) for their original song, “202.” The John Lennon Educational Tour Bus announced that the winning band will perform at the 2018 National Association of Music Merchants (NAMM) Show in Anaheim, California on Jan. 28. Founded in 1997, the JLSC is a premiere international, year-long competition open to both amateur and professional songwriters. As part of the submission process, the JLSC requires applicants to enter one original song that is under five minutes long. Songs are judged based on originality, melody, composition and lyrics by legends of rock and roll including Flea of the Red Hot Chili Peppers, Fergie of The Black Eyed Peas and Bob Weir of The Grateful Dead. In addition to the NAMM Show performance slot, winners of the JLSC receive a professional live music recording and over $10,000.00 in gear. With more than 99,000 visitors, the NAMM Show is the world’s largest trade-only event for the music industry. Red Letter Day will be performing on the Main Stage in the Grand Plaza at noon, which is open to the public. More information on Red Letter Day is available at http://www.redletterdayla.com. For press inquiries and photos, please contact Elana Yaffa by email or at (818) 281-8290. Red Letter Day is an LA-based trio of young musicians who have broken on to the music scene with original lyrics and an authentic sound. Will (18) John (17) and Alex, (16) are all accomplished in their craft as evidenced by their achievements of winning, in addition to the John Lennon Songwriting Contest, the Bringing Down the House, House of Blues Music Forward Foundation Competition and as headliners on the Skate Stage at Jay-Z’s Made in America Music Festival. Will and Alex attend The Los Angeles High School for the Performing Arts and live in the San Gabriel Valley and John attends Chaminade College Prep and lives in the San Fernando Valley.